Let’s talk dinner. What are you having tonight? Do you know yet? Do you not wake up at 6am automatically thinking of food? I do. Is that weird? I wake up thinking of different types of pasta, the little dark chocolate coconut chewies in the bulk bin at the health food store and how great it would be if someone had a thick slice of sourdough toast topped with blood orange-carrot marmalade waiting for me with a cappuccino right by my bed….but doesn’t everybody? For the past two nights, I’ve been eating my weight in this super easy pasta dish! I love it partially because of the BOW-TIES! They’re fun. When a guy knows about and loves hen of the wood mushrooms, he’s a keeper. These mushrooms are not hen of the wood. They are sliced cremini from Trader Joe’s. Some of us don’t have access to the mushroom stand in the ferry building on a daily basis. I made a flavorful sauce with the mushrooms, CREAM, beef broth (you could use chicken), shallot and garlic. Then I added some chicken, pasta and cheese. Still with me? The whole thing came together in only 15 minutes and tasted even better leftover the next day. Don’t ya love that? And with that my sweet friends, dinner is served. I think you’re gonna love it. PS: the winner of the 360 Cookware Giveaway is comment number 1036—Nicole! Congrats, Nicole! Please email me to claim your prize. And thank you to all of you for providing such constructive giveaway feedback—especially those of you that took the time to email me your thoughts! It seems like the general consensus is that the majority of you like cool free stuff as long as it doesn’t take over the blog or get all weird and random. My thoughts exactly. Heat up the oil in a large skillet over high heat. Add the chicken and cook for about six minutes, until cooked through. Remove chicken to a plate and drizzle in a teeny more oil in your pan. Reduce heat to medium/low and add the minced shallot, followed by the garlic, mushrooms and a pinch of salt. Cook until mushrooms are juicy—about five minutes. Then, slowly stream in the broth and cream. Add the chicken back to the sauce and bring to simmer for a couple minutes. Cook the pasta in boiling salted water. Drain and add pasta to the sauce. Add the salt, pepper, parmesan cheese and parsley. Serve. 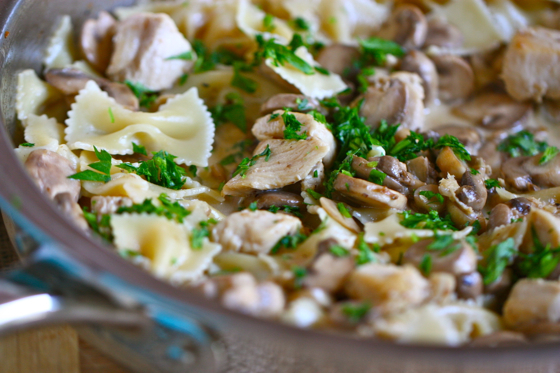 My husband would love this dish … he loves anything with mushrooms. 🙂 Thanks for sharing! I have everything for this recipe already in my fridge. That alone makes me ridiculously happy. Will be trying this tonight! You have to catch me on a good day to enjoy mushrooms. I’m not into fun-gis…. 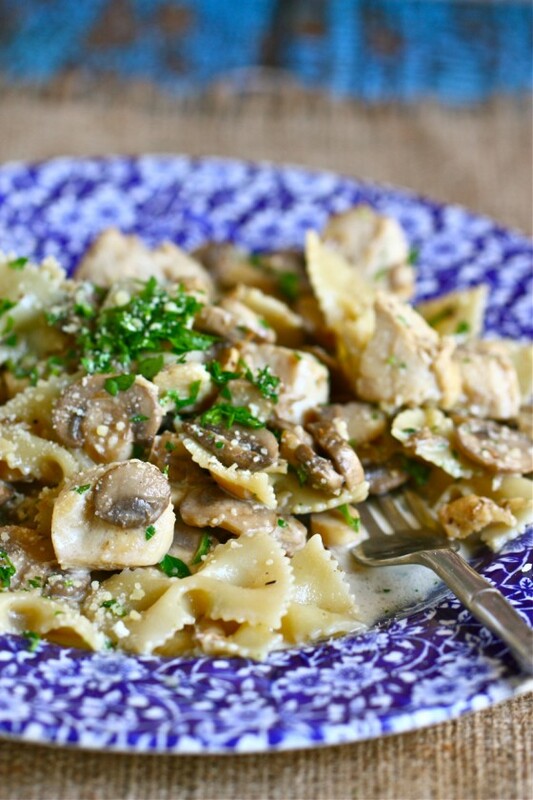 I love mushrooms as well – they make such a great meat substitute and this dish sounds so affordable but seems so decadent! This looks like the perfect simple dinner. I never used to like mushrooms growing up but now I can’t get enough of them. I think it had something to do with awful beef stroganoff that they served at my day care as a child. Traumatizing. Glad I got over that one! I love mushrooms in red pasta sauce! Oh my, this looks delicious! I know the Mr will love it too! I love mushroom & chicken combos! I can’t wait to hear about more about your Yoga experience! lol thats so funny he knew hen of the wood mushrooms! this looks delicious! i love fast flavorful dinners like this. YUM! My bf doesn’t like mushrooms actually.. I always add them to my pasta dishes though! Looks amazing. And reminds me of this dumb saying: There’s a fungus among us. Keep saying it. It gets more fun. Maybe that’s just me. Any suggestion on a substitute for the mushrooms? I like the idea of mushrooms, but I don’t personally enjoy them. Thanks! Unfortunately mushrooms are the main part of this recipe so I don’t really recommend leaving them out! 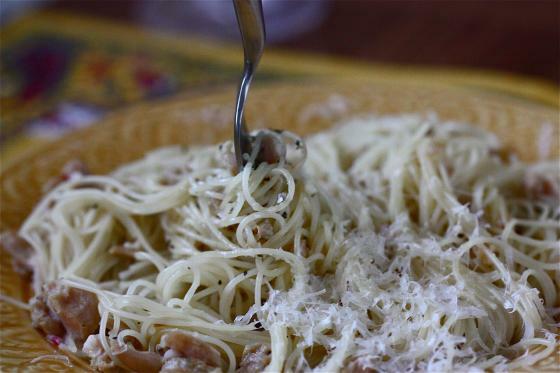 If you’re looking for just a creamy pasta recipe, try this one! oooo the base of this looks SO good – i’m with @amy_c, though… i’m not a fan of mushrooms either – i’ll have fun playing around with a substitution for them! YUM YUM YUM YUM! Y to the UM. Making this soon!! Considering I got into a heated (hormonally driven) argument with my husband last night about how it would be nice if he could just “learn” how to put something together besides salad or Annie’s mac n cheese for the nights I don’t feel like cooking, I am completely envious of your “hen of the wood knowledgeable” boyfriend! 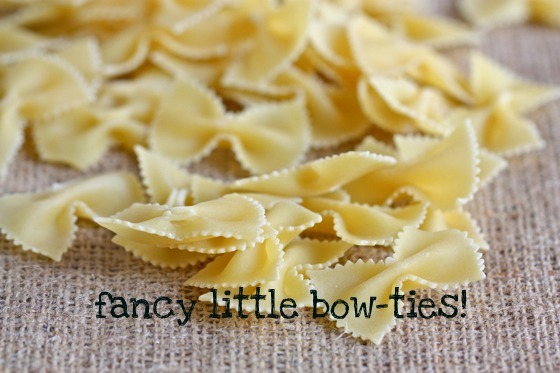 You had me at bow tie pasta and mushrooms. Adding this to my to make this!! I LIIIIIIIVE FOR FOOD LIKE THIS. I have been craving mushrooms the past week or so and definitely need to pick some up now. I love that blue-trimmed plate you used. So pretty! My fiance would love this dish, I’m excited to try making it for him! Any tips for cooking in a dorm room, anyone? I used to make Top Ramen in my coffee pot. It was the only thing that got the water hot enough and kept it hot…I don’t know if it would work on dried pasta, but it should work on fresh pasta. Yep–having this for dinner tonight. Thanks! I’m reading over your early posts – soooo cute! Love you some mushrooms you say? Me too! Especially in cream sauce. Oh yum yum yum! That sauce looks luscious. I’d be sorely tempted to serve this over rice and soak up every last bit of that sauce. Is the beef broth or chicken stock necessary? Could I substitute it for veggie broth or just leave it out? I seriously think I love my husband more when he makes comments about food! One of the best things ever is when a boy raves about a meal you made yourself! I would say this delicious looking mushroom dish would get lots of raves! I’m trying it this week so I’ll let you know! looks yummy I love mushrooms too! Fast, easy, simple, delicious! Love this! Yum. Nothing better than the savoriness of mushrooms. Thanks for the idea! AH this sounds so good. And funny you should ask…I’m making mushroom quinoa risotto for dinner tonight. Guess you’re not the only one with mushrooms on the brain! I’m getting to the point where I like mushrooms more than meat! Especially in a cream sauce. Yum. 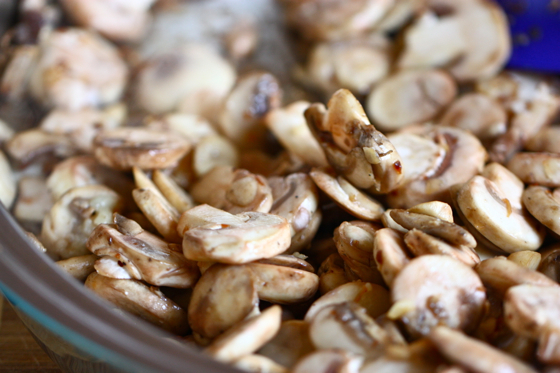 I have needed a go-to mushroom recipe like this for quite some time. I kept thinking that I would develop one buuuut of course haven’t gotten around to it. This will definitely fulfill that need, thanks Jenna! I loved reading “how do you NOT wake up at 6am and think about dinner?”. My fiance thinks I’m crazy for asking him about dinner before his stomach has had the opportunity to think about breakfast. She or He with the desire choose the dinner in that instance! And @Colleen – me too! Just had a portobello burger for lunch :)! 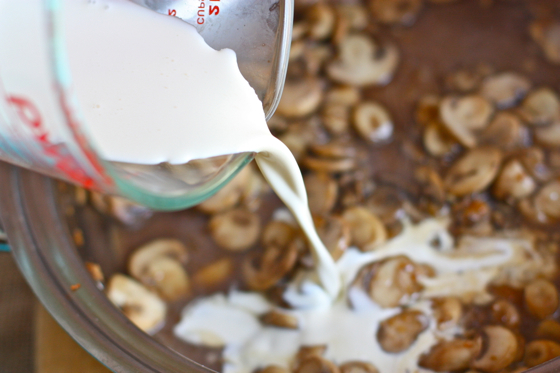 This recipe is very similar to one of my favorites, but instead of beef broth and cream I just use a can of cream of mushroom soup. Looks like I’ll be trying this as it’s seemingly less processed. I made this for dinner tonight and substituted Chardonnay for the broth. It was excellent! I also recommend making more sauce as I couldn’t get enough of it. Brandy would also be good in this. mmm chardonnay (or brandy!) would be super yummy—glad you enjoyed it! Chicken, pasta and cream were made to be together. Looks wonderful! Creamy mushroom anything is a win in my book! Looks great! Any substitutes you could think of though for the mushrooms that would go well with this dish? Unfortunately I’m not a huge mushroom fan but would love to make this and sub some sort of summery/hearty veggie that would hold up well in the sauce! I imagine asparagus would go good in place of mushrooms! I would love to try this, but like a few previous posters, my fiance doesn’t do mushrooms. I am making this tonight! I needed something easy and quick for dinner…plus, I already have mushrooms (although now chicken or cream). I’ve never heard of hen of the wood mushrooms. I’ll have to do a little recon on these! Mmmm, I love me some mushrooms. Thanks for the recipe! I’m a fan of anything with mushrooms. Make it a cream sauce and I’m in heaven! My fiance and I are huge fans of mushrooms but my best friend, not so much. It actually makes me kind of sad. She said she doesn’t like them because of the texture. 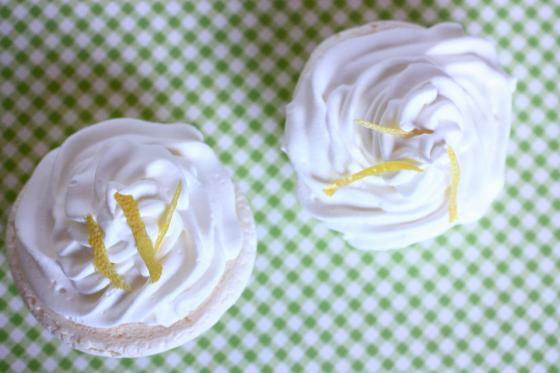 The best part about this recipe is that I have all ingredients! I just have to defrost a couple of chicken breasts and I’m good to go. 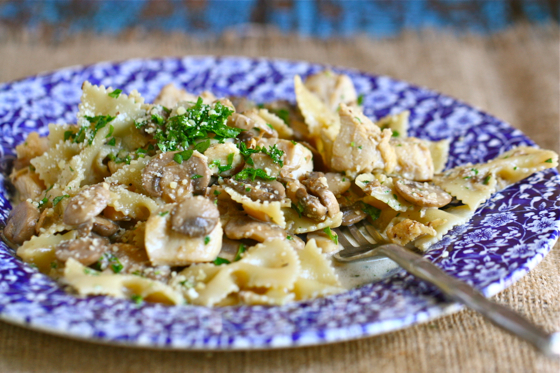 I can’t wait to try this out….pasta, mushrooms, cream and cheese–I’m in! I made this the other night and it was delicious! My husband also liked it & said we’ll have to make it again! Just finished the leftovers today…….YUMMY! Any suggestions for a wine to serve with this dish? I want to serve this to my in-laws and they like wine with dinner. Looks delicious! Have you tried or would you recommend adding grape tomatoes to the meal for a little added color and flavor?? Grape tomatoes would be super good in this…I might roast them in the oven first to caramelize them and add more sweet flavor! I have now made this dish three times…my fiance absolutely loves it and requests it regularly! Just had this for dinner – delicious! I didn’t have parsley so I added some thyme. Thanks for the recipe inspiration! Just wanted to say I made this recipe tonight and it passed the husband’s approval! I did add some flour to the cream/broth mixture to thicken it up-it was delicious! Just made it–upped the garlic, broth and cream–was absolutely delicious! So good! I used portabello and shitake mushrooms, whole wheat bowties, half and half, and no shallots but onion powder instead (I like onion flavor not texture) and a wine chicken broth I found at the fresh market. Turned out fantastic! I served it with homemade toasted 5 grain garlic bread, my boyfriend is going to be so happy when he comes home! Made this tonight. Yumbola! My husband LOVED it and so did I. Thanks. I just found this recipe on Pinterest & made it tonight. It was wonderful!! I have a family of 5 and only had one chicken breast on hand. I found 2 lonely Italian sausage in the freezer & cooked them up along with the chicken. Because of the extra oil from the sausage, I didn’t have to add any extra oil with the shallots & mushrooms (and chopped asparagus, another addition). This turned out fantastic!! So simple, so delicious. My husband RAVED!! This will go on my permanent meal planner, thank you!! Hi, I’m trying out this recipe tonight, but have a question; the recipe calls for 8 oz of bowties, but you say it generously feeds 4. Do you mean a box (16 oz) bowties? I can see easily getting 2 or 3 servings out of 8 oz, but 4? LOL, just made the dish using your proportions (8 oz of bowties) fed 2 people and have TONS left!! Very yummy. I used this for leftover chicken (held the chicken out till last couple of minutes). Will use this as a go to recipe for chicken, and would also use the mushroom base alone (no chicken) or with risotto. This looks SO good! I also LOVE that plate, where is it from? Just made this for my fiancee. He loved it! Though I only added half the amount of mushrooms and it was fine and I added some butter to the sauce. This looks amazing and I have a house of mushroom lovers! Any idea on a substitute for the cream? We’re mostly and newly dairy free over here (so sad…) and I need help with good subs. can i use campbell cream of chicken instead of cream and chicken broth? 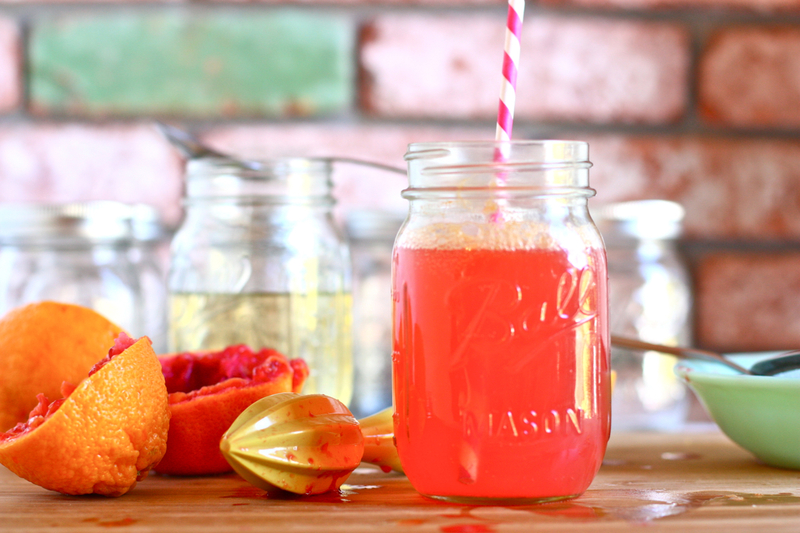 My family absolutely loved this recipe, we’ve made it at least a dozen times! We’re making it one more time before we begin Whole 30! Thank you so much for sharing it!